Andy Rooney once said that making duplicate copies and computer printouts of things no one wanted in the first place was giving America a new sense of purpose. And while that may be a bit of an exaggeration, nobody would dispute the fact that a lot of printing goes on, particularly in government. In the past, the GCN Lab has looked at network printers designed to service large workgroups. But there is another class of printer that is heavily used in government as well, and that is the executive printer used by managers. Perhaps the executive in question is considered too important to have to share a printer with the rank and file people working in the same office. Or perhaps they deal with sensitive issues, such as human resources, that should not be shared. You would not want a bunch of salary data just sitting around in a group printer for anyone to pick up. For these people, an executive printer is the perfect solution. 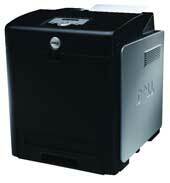 Executive printers are designed for use by one person and are generally attached to a single PC via a USB cable. As such, while speed is important, it is not as critical as it is with a shared system, since no lines are going to be forming behind it. Quality is, as always, an important issue. A small footprint is also desirable since the printer generally has to squeeze onto a desk inside an office or cubicle. And value is a big deal as well. The GCN Lab looked at eight printers designed with a single user in mind. 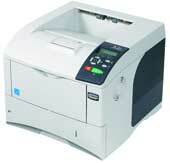 The 3110cn is a good example of an executive printer. It has a small form factor and is extremely easy to set up. Most of the components needed to make the 3110cn work are already inside the printer when you get it. And although our unit was not tested in this way, there is a wireless adapter that would allow for wireless printing, eliminating the need for a USB cable and enabling the printer to be shared by other systems in the office. Unlike most of the other executive printers in the roundup, the 3110cn has a large and useful LCD that gives helpful information. By default, it displays toner levels in all four colors so you know if one is starting to get a little low. The color printer does a nice job in terms of quality. Neither its text-only or graphical printing stood head and shoulders above others in this review, but neither did it experience any of the flaws of other systems. Dark colors came out clean with few details missing and lighter tones also reproduced well. Other than very discerning graphical-oriented professionals, users of the 3110cn will not be disappointed when churning out text-only memos or business graphics with spot colors. Even photographs were reproduced adequately. In terms of speed, the 3110cn seems really geared toward text. It crunched out our 30-page all-text document in just 1 minute, 7 seconds, for the second-best time in the review. It was a little pokier with a graphical document, finishing in 2 minutes, 5 seconds, the fourth-best time in the review. With a $499 price tag when bought directly from Dell, the 3110cn is a great value. For a small and fast printer with good quality that won't break the bank, you would be hard-pressed to find something better suited for a manager. 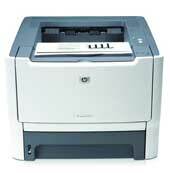 The LaserJet P2015 is a black-and-white laser printer. Because it does not need to find space for cyan, yellow or magenta toner, the P2015 can fit into a relatively small space on a cluttered desk. Setup is extremely easy. The installation software checks for any new versions or printer drivers during the install, a great feature we only found with HP printers. You know you are up to date whenever you install an HP printer. Most of the status monitoring is done on your computer's monitor, which is fine for a system designed to be used by a single person, where the system and printer are very close together. If the printer runs out of paper for instance, a popup window appears letting you know that your document can't finish until you add more paper. The P2015 is pretty good in terms of speed. It finished the 30-page text document in 1 minute, 9 seconds for the third-fastest time in the review. It also blazed through our graphical document in 1 minute, 11 seconds, the second-fastest time recorded. But before you go racing off to capture this speedy printer, know that the fast graphical printing times are balanced by a poor-quality image. Of the two black-and-white printers tested, the P2015 was better, but still had its share of problems. Dark photos and images came out without a lot of fine details and light ones were washed out. Also, color balancing is not a strong point of the P2015. It's a fine system if you are looking for one that prints text very quickly but not one you want if you to print any type of photos or fine images. The $349 price of the P2015 is good and puts it in the budget-printer range, though unless raw speed is what you crave, you are probably better off with the HP Officejet Pro K5400. It's slower but cheaper, and produces far-better-quality images. The C532dn is a personal printer with a small footprint that is obviously geared toward graphical printing. It is not exactly fast, finishing the 30-page graphical document in 3 minutes, 4 seconds, for the fifth-best time out of eight printers. But the images the C532dn produced were fantastic. Only the Xerox Phaser 6280N ties it in quality. Even with extremely dark images, fine details and somewhat hidden lighter ones are reproduced accurately. Color balance is perfect, to the extent that sometimes photos don't look as good as you think they do on your screen. The 6280N will expose all image flaws, even ones we purposely induced into our test documents that other printers missed. Installation is very easy. All the toner cartridges come loaded into the printer when you take it out of the box. You simply have to pull a bunch of safety tabs ' which are marked in bright orange ' to release everything. This tends to generate a fairly large pile of trash, but makes setup very easy. When you initially turn the printer on, it checks for any packing material you missed and lets you know if you need to go back and pull more out. Otherwise, you're green-lighted to begin printing. Straight text printing is adequate, though nothing special. And text speed is fairly middle of the road as well. It finished our text-only 30-page document in 1 minute, 31 seconds, taking sixth place there. The 6280N has a fairly big LCD screen, but it does not seem to do much of anything. You can use the front buttons to get it to display troubleshooting menus and toner levels. Otherwise, it just kind of sits there. For a highly accurate color printer, the $714 government price ($849 retail) is quite a value. Although it's a tad slow, the images it churns out and the great price make it more than worth the wait. The Kyocera FS-4000DN is a black-and-white laser printer that crushes the competition in some areas even as it crashes and burns in others. The small- footprint printer is fairly easy to install. However, you have to wait 15 minutes for a burn-in process to complete. During the install you can set up common profiles that can then be used later, such as one to save paper or toner, add letterhead or run transparencies through the FS-4000DN. In terms of speed, the FS-4000DN can't be beat. It burned through our 30-page text document in 50 seconds and the 30-page graphical one in just 57 seconds. That earned it the top speed in this review for both tests. This speed, however, comes at a heavy price. The quality of images and even text produced by the FS-4000DN is below average. Darker images tend to lose all fine details while lighter ones come out grainy. Text is very lightly printed on the page. When held up to the output produced by every other system in this review, it is easy to see that the FS-4000DN can't compete in this area. Long bouts of reading pages produced by the printer would induce eyestrain in the extreme. It's almost as if the printer is working so quickly that it does not have time to put enough toner on the page, although for images it sometimes slathers it with too much. Given the poor quality of prints, the $1,677 price tag seems rather high. If you are only interested in raw speed and draft-quality printing then the FS-4000DN might work out for you. There are so many bad things to say about the FS-C5025N that it is difficult to decide where to begin. So let's start with the one positive thing that we can say. The text that comes out of the FS-C5025N is quite good. There is none of the standard brown hue that pollutes some of the other color laser printers' text reproduction. We were happy to see great text quality, but things went downhill after that. The quality of the graphics produced by the FS-C5025N is the worst in the review, and among the worst we have ever seen in our many years of color printer testing. Blues come out either blackish or as a sort of off-color purple. Photographs have a white sheen over them that make them appear blurry. Bright images of sunny shores are printed as if the skies were heavily overcast. Printing text over graphics produces some of the worst halo effects we have observed. Line art comes out blurry, as if the colors that make up the lines were separated and not mixed properly on the page. We rechecked the setup several times to confirm our results and even ran quite a few pages through the printer in case there was a lump of bad toner or something. But no matter what we did, the quality never improved. On top of that, the FS-C5025N was extremely slow. It finished the 30-page text document in 1 minute, 45 seconds, the sixth-slowest in the review. It finished the graphical 30-page document in 3 minutes, 45 seconds, the worst time of all the laser printers and only 39 seconds faster than the ink-jet printers. We could possibly recommend the FS-C520N for those who only want to print text and who could ignore the unit's color functions, but the $2,013 price tag would be way too high for a standalone black-and-white printer. When we said executive printers, we did not specify laser printers. In fact, in a lot of cases a modern ink-jet printer can compete with most laser printers, especially for personal or individual use. 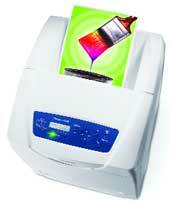 In general, the ink-jet printers cost less than a laser printer and have good quality at the expense of speed. That pretty much sums up the K5400. At just $149, the K5400 is the lowest-priced printer in the review. And it holds up to the laser printers here in a lot of ways. It certainly can brag about good quality, which combined with the price gives it our highest score in terms of value. The printer has a small footprint and is extremely light. Setup, however, takes a very long time. Just installing the proper drivers took almost 10 minutes of us just watching the little progress bar slowly fill up. And once that is complete, guess what? You are going to be waiting yet again. There is a mandatory 12-minute initialization process where the printer checks all its facets and primes the ink to begin flowing onto your documents. Putting the K5400 together is a bit like putting together a puzzle, though a very easy one. Basically you have to snap the correct ink cartridges into place. It's neat to see long colorful tubes leading out of the ink reservoir that will soon be carrying your ink to your pages. It kind of brings to mind a type of Jules Verne machine, and certainly has a different flavor than any of the laser printers. When you start printing pages you will notice that, by default, they come out with the last page in a document first, with subsequent pages landing face up on top. We really like this setup because you can see at a glance how far along you are in the printing process. This is helpful because you will likely be waiting a long time. The K5400 comes in dead last for both text and graphical printing speeds, though not by a huge amount. It printed 30 text pages in 2 minutes, 42 seconds, and 30 highly graphical pages in 3 minutes, 44 seconds. The K5400 did produce the second-best text in the review, with a rich and readable black that most laser printers tend to stumble on a bit. It also produced some very nice color images, though, as a negative, you have to remember that the pages come out a bit wet. Our super-graphical-intensive test document came out feeling a bit soggy, although none of the images seemed to run or smear. After all, more images equals more moisture. The K5400 is a great choice if you have limited space and budget, and you want to quickly add color printing to your menu. The Phaser 6180N was a little difficult to install, though this is helped somewhat by an installation video that shows you how to go through the process. You will need to put a lot of components into the printer as well as pull quite a few safeties back out. Expect a big mound of trash when you are finished. 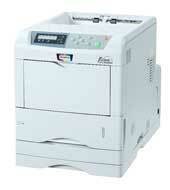 The 6180N seems to be going after the same color-hungry market as the Lexmark C532dn. Lexmark and Xerox always seem to be going head to head in these reviews in terms of color quality. Sometimes Lexmark wins and sometimes that crown goes to Xerox. This time, it's a tie. Putting the output of the 6180N beside all the others, it is easy to tell that it and the Lexmark are the top in terms of quality. Then things get tricky. If you go through our entire 30-page sample document and test for color accuracy and detail reproduction, the best of the best flip-flops a bit. One page will be better on the Lexmark and the next will be better on the Xerox. The Xerox tends to do better with computer-generated images and light-colored photographs, while darker ones tend to favor the Lexmark. What is obvious is that these two printers are in a different class than the others in terms of color and graphical quality. The Xerox is not speedy when generating those fine images, though. It took 3 minutes, 6 seconds to print 30 pages heavily sprinkled with graphics. It finished next to last in terms of speed, only a bit quicker than the ink-jet entry. For text, the Phaser 6180N speeds up quite a bit, finishing the 30-page test document in just 1 minute, 14 seconds, which was the fourth-best time overall and only a few seconds behind the leaders. Text quality is good, though not great. The form factor of the Phaser 6180N is a little large for an executive printer. Users would have to be pretty high-ranking on the GS scale to have room in their office to comfortably fit one, but the price is right at $499. If you are looking for a color printer with awesome color reproduction and don't want to break the bank (and if you have space for it) then the 6180N is an excellent choice. The C5500n is fairly small, though it runs pretty deep because of the way the toner cartridges are set up. The unit is also a little heavy, so two people are needed to safely lift it out of the box and into your work area. You will find the toner cartridges already installed, which is a big help. The C5500n produces good, clean and readable text. And it is the only printer in this review with an extremely steep angle on the paper return tray. This may not seem like a big deal, but when you are printing a lot of pages, the steep angle keeps the paper from flying out of the printer or falling into disarray. When you are trying to even the corners on a 400-page document produced with other printers, you will wish your paper return area was so well-designed. 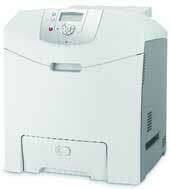 The C5500n won't be getting any speeding tickets when printing text documents. It finished our 30-page text document in 1 minute, 25 seconds, which garnered it fifth place overall. It does a lot better with graphical printing, not stopping to pause even with our torturous 30-page graphical nightmare. The C5500n finished that document in 1 minute, 44 seconds, capturing third place overall. And the graphical images the C5500n produces are quite good. It tends to put a shiny film or sheen over photographs that make them look more like real photos and not a reproduction. However, this can be a bit of a double-edged sword, since dark photos tend to be a little too dark. This does not harm the detail, just the color matching. If something is supposed to be dark blue, it comes out looking a bit more like navy blue. It's a slight distinction and only a few hex triplets off from the true color, but something people needing true color matching might want to consider. If you are looking for a printer to give you good text and to polish up photographs you put in your documents (business graphics also shine quite a bit) then the $599 price tag for the C5500n makes it a good choice.